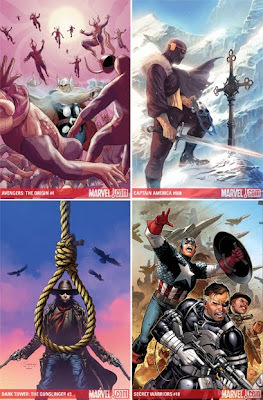 Artist and Title: PHIL NOTO - Avengers: The Origin #4 (of 5), MARKO DJURDJEVIC - Captain America #608, SEAN PHILLIPS and RICHARD ISANOVE - Dark Tower: The Gunslinger #3 (of 5), JIM CHEUNG - Secret Warriors #18. For full Marvel July solicitations and cover images visit Marvel Comics. Yeah that is a pretty iconic shot of ol' Zemo... Marko's doing allot of great work at the moment... I'm surprised Marvel doesn't have him chained to his desk! !